Rigorous clinical trials are essential in the approval of any new drug by the FDA, or equivalent agencies elsewhere. Clinical trials are generally conducted in three phases prior to licensing of a medicine: Phase I; Phase II; and Phase III, with phase I focussing on the safety, phase II on efficacy and phase III on comparisons with existing treatments (Bazell provides an excellent description on page 60). Alternating between the human story (through accounts from patients) and the company perspective, Bazell gives a full account of all three phases in the case of Herceptin in chapters 6 – 11. Phase I and II clinical trials represent the first stages of human testing of any new drug or medical device. They are small scale and intended to establish the safety of a new product and give an indication of efficacy. In chapter 6 of HER2 Bazell describes how, based upon the research undertaken by Denis Salmon and others (both within and without the company), Genentech began phase I and II trials of trastuzumab simultaneously in 1990 at three US hospitals. These were UCSF and UCLA in California, and at Sloan-Kettering Memorial Hospital in New York (the rationale behind choosing these three centres is given on pages 61-64). Trastuzumab was tested alone at all three hospitals in women with advanced stage breast cancer who had exhausted all other treatment options. However, at UCLA, under the oversight of Salmon, it was also tested in combination with an existing chemotherapy, cisplatin. This combination stemmed from Salmon’s earlier work in pursuit of “a concept that had struck him just before Genentech decided to forge ahead with the Her-2/neu trials” (1998: 77). Possibly given his role in pushing Herceptin forward and the trial of a combination therapy, Bazell’s account of the phase I trials focusses largely on Salmon’s oncology clinic at UCLA. Using the story of one particular patient as a vehicle, Bazell documents the experience of the first group of patients to take Herceptin (in combination with cisplatin). In Salmon’s phase I group were fifteen women, all of whom “would have been considered terminal” (1998: 84). They were given a 3 month course of the Her-2/neu antibody (as the drug was known at that time: it did not acquire the name ‘Herceptin’ until 1995, as detailed on pages 142-143) with cisplatin, in order to “test the safety and dosage range” (1998: 84) of this regime. However, as Bazell notes the Her-2/neu antibody’s effectiveness – a phase II criterion – became obvious in Salmon’s phase I group, much to the delight of both doctor and patients. Thus, at the end of the initial three month period, the phase I combination trial flowed smoothly in phase II (bar a six week hiatus while UCLA and the FDA completed the protocol paperwork). Five of the original fifteen women in the phase I group continued on to receive another, three month, course of the antibody in combination with cisplatin. Of the ten who did not take part in the next stage of Herceptin’s human testing, three had died during phase I, and seven were excluded from the phase II trial. This exclusion raises one of the most important bioethical issues connected to clinical trials of new drugs. According to Bazell, the seven women in the UCLA phase I combination group were excluded from phase II because “there was no way to follow their progress with objective measurements… so their cases would provide little additional information” (1998: 86). These women all had bone metastases, the extent of which could not be measured in the same way as a CAT scan can measure the size of a tumour in the liver, lung or brain. Since, phase II trials are concerned with demonstrating the efficacy of a new treatment and “the standard measure of positive response in a cancer trial is a reduction of the tumour mass by at least 50 percent” (1998: 85), this meant these women could not provide Genentech with the results they needed at this stage of Herceptin’s path to market. Although they had experienced no ill effects from Herceptin and had therefore satisfied the conditions for phase I, their qualitative reports of improvements in their condition were insufficient for phase II. The ethical dilemma implicit here is neatly summarised in the following quote made in relation to the exclusion of women who had not taken part in phase I trials from the phase II stage (specifically compassionate access to Herceptin via phase II trials for women who did not meet the inclusion criteria): ” “If you start making exceptions and deviating from your protocol, then you get a lot of patients whose results are not going to help you understand whether a drug works or not. All you are doing is delaying our ultimate knowledge of the drug’s efficacy and being able to get it out to the public” ” (1998: 127). What is being expressed here is the tension between helping a few additional people immediately, and a much larger group later on – as it is only through sticking to the FDA approved protocol and procedures, and admitting only those patients that will give homogeneity to the trial group and measurable results, that the drug can be brought smoothly into wider, licensed, use. This is a difficult utilitarian balancing act, particularly since in 1994 Herceptin already had a reputation for being able to prolong and even save lives. The perception was that by not admitting women who did not fit the protocol into the trial Genentech were effectively condemning them to death. However, from Genentech’s point of view, the inclusion of these women could result in confused data and logistical problems that might delay the licensing of Herceptin, a situation that might cost even more lives in the long run. That both the exclusion of women from clinical trials and Genentech’s (initial) resistance to compassionate access caused “some anger” (1998: 86) among patients and activists may also reflect the different motives and locations of patients and clinicians/companies who are both desperate for new treatments: patients may want anything they think can help for as many people as possible; while clinicians/companies arguably want a licensed product they can be sure of in prescribing to hundreds or thousands of people. In discussing the progress of the phase II trials of Herceptin, Bazell again follows this through the eyes of one patient. In this case a member of the group at Sloan Kettering, which received eleven, weekly, transfusions of the Her-2/neu antibody alone. In accordance with the FDA approved protocol, these were “documented by photographs” (1998: 104) in which the participant Bazell discusses was required to display her mastectomy scar (there appears to be an additional ethical issue implicit here concerning – among other things – representation). This group was composed of 27 participants, with the remaining 16 of the total of 43 patients receiving antibody alone being treated at UCSF. The results of the phase II trials of the antibody alone were published in 1996 (see Baselga et al., 1996) with those from the Her-2/neu and cisplatin phase II trials following in 1998 (see Pegram et al., 1998). In general the results of clinical trials are reported in terms of ‘endpoints’ and ‘responses’ (this article by Steve Dunn for CancerGuide gives a detailed explanation of many of the technical terms found in reports about clinical trials). Response to therapy – which, in short, is a quantitative measure of tumour shrinkage – is divided into a number of categories. Firstly, there is ‘objective response’ which includes both complete remission and partial remission, and relates to the 50% tumour mass reduction criterion mentioned above. Secondly, there is ‘minor response’ which refers to a reduction in tumour mass of between 25% and 50%. Thridly, there is ‘stable disease’ in which tumour mass neither increases nor decreases (within 25%). Finally, there is ‘disease progression’. This last category indicates that the drug has had no effect on the disease and metastases have continued to grow and/or appear. Table 1 (right) outlines the main results for each of the response categories, as reported in Baselga et al. (1996) and Pegram et al. (1998), for the phase II trials of Herceptin. Bazell summarises these as “the tumors shrank in one quarter of the women. But if one took into account tumours that either did not grow or shrank a little, more than half the women had a positive response” (Bazell, 1998: 107). 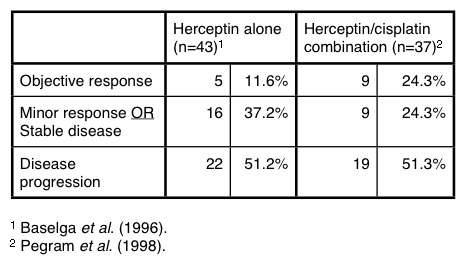 Although, as Bazell notes, these results concerning the safety and efficacy of Herceptin were met with “guarded optimism” (1998: 107), taken together they justified the “further evaluation of this agent” (Baselga et al., 1996: 737) in phase III clinical trials. In comparison to phases I and II of clinical trials, Bazell states that “Phase III is a wholly different process. It is a test with hundreds, even thousands of patients to establish whether the drug works well enough to support an application to the FDA to bring it to market” (1998: 60). In order to complete this procedure, Genentech had, not only, to design the complex experiments that would form the different parts of the trial (which included integrating advice from a range of different stake-holders), but also, “to recruit hundreds of doctors, win approval of their hospitals, and, finally, motivate the doctors to persuade hundreds of patients to participate” (1998: 134). This was a daunting and costly process for the company, particularly since they had to establish a new manufacturing facility in order to deal with the much greater supply of the Her-2/neu antibody that would be required by phase III. According to Bazell “anguish and delay … marked the company’s preparations for the phase III trials” (1998: 130), a situation that Her-2 attributes partially to Genentech’s lack of experience in clinical trials (see pages 134-135). However, eventually the protocols were complete and the “logistical nightmare” (1998: xiii) that was phase III trial implementation began. The phase III trials of Herceptin were organised into three parts: trial 648, trial 649, and trial 650. Trial 648 was the most crucial for Herceptin’s licensing. It was double-blind placebo controlled study to be carried out with women who had been newly diagnosed with metastatic breast cancer. The women were to be randomly divided into two groups: one of which was given chemotherapy consisting of the two drugs Cytoxan and Adriamycin (referred to as ‘CA’) every three weeks and an infusion of Herceptin on a weekly basis; and the other three-weekly CA and a weekly infusion of saline. The other two trials involved smaller groups of participants: in trial 649 women with advanced metastatic disease who had already received at least one round of chemotherapy, were given the antibody on its own; and in trial 650 Herceptin was again administered alone, though this time in patients who were newly diagnosed but had refused chemotherapy. The implementation phase of these trials was organised by the drug-contract research organisation Corning Besslar and, in 1995, the experiment commenced in over 150 sites around the world. At this point, given the Her-2/neu antibody’s relatively smooth progress through phase I and II trials, and Herceptin’s current status as a ‘wonder drug’, it might be assumed that all Genentech had to do was sit back and wait for the phase III data to roll in. However, and this is one of the main points made in this post, the practice of clinical trials – particularly complex phase III trials – is rarely as simple as theory and protocol seem to suggest. In the case of Herceptin, this became apparent when all three of the phase III trials failed to recruit participants. This was a particular problem for the crucial trial 648, and in the first few months only fourteen participants signed up to take part. Even at this early stage Genentech was concerned that this “failure to accrue” (Bazell, 1998: 142) would be fatal, not only for the trial itself, but also because Herceptin “might never reach the women who needed it” (1998: 147). The existence of proven treatments: As Bazell notes, in contrast to the patients involved in phases I and II of the Herceptin trials, the women Genentech planned to include in phase III already had proven – and licensed – treatment options available. Not only could patients expect to receive surgery (an option Herceptin was never designed to replace), they also had a full range of chemotherapeutic options as well as ABMT (also know as “bone marrow rescue”). As Bazell summarises: “No company had ever tested a breast-cancer drug in the newly diagnosed population because doctors did not want to use an unproved therapy on patients in the early, more treatable stages of disease” (1998: 137). Medical ethics beyond prescription: According to the Principles of Biomedical Ethics described by Beauchamp and Childress (1994), a doctor’s ethical responsibility towards a patient extends beyond caring for their physical wellbeing to, both, their emotional, and psychological care, as well. This duty apparently came into play in the phase III trials of Herceptin, as clinicians may have decided against revealing or enrolling patients on the 648 trial for fear of “setting their patients up for disappoinment” (1998: 147). While Bazell suggests that, for doctors whose experience of the trial was “referring eight or nine cases in a row whose results came back negative” (1998: 147), further referrals “did not add up to a worthwhile effort” (1998: 147), it also seems likely that any patient distress they may have witnessed, combined with the ethical precept of limiting testing to instances where the patient will directly benefit from that test, had an effect on individual clinicians decisions to enrol vulnerable patients. Differing company, clinician and patient motivations for participation in clinical trials: In illustrating the barrier the placebo posed within the Herceptin phase III clinical trial, Bazell again uses the story of one particular patient as an example (see pages 148-151). In this case the patient, having enrolled in trial 648 in full knowledge that she may receive the placebo, experienced disease progression that indicated to her physician that she was not receiving the Her-2/neu antibody that could save her life. Thankfully for this patient, this situation was rectified swiftly by her oncologist’s proactive approach, however her story does highlight the problems associated with a strict double-blind placebo condition: the incentive to participate in the trial is access to a potentially life-saving drug. Where this incentive disappears (or at least is uncertain), so too does the motivation for referral and participation on the part of doctors and, vitally, patients, and as Bazell notes “most cancer doctors refused to submit their patients to the possibility that they would face” (1998: 147) the situation described above (however, it should also be noted that patients were apparently fighting to get onto the trials – see pages 161-162). Restrictive interpretation on FDA requirements: It is notable that, by page 154 of Bazell’s book, the use of a double-blind placebo controlled protocol has gone from being the “gold standard” to what is described as “the poor design of the clinical trial” (1998: 154). That this shift took place as the 648 trial failed to accrue participants suggests that Genentech’s interpretation of the FDA requirements – as summarised by the then FDA Commissioner – for a “large trial, …clinical endpoints of statistical power, and…able to demonstrate unequivocally that the drug worked” (1998: 154) in an inappropriate or at least restrictive way. While Bazell does not describe the formalities of the enrolment process in any great detail, it is acknowledged that “the process of enrollment was difficult” (1998: 146) for oncologists. This was recognised by Genentech as a factor affecting the recruitment of patients to the phase III trial (so much so that the process was streamlined in 1996 – see page 156). Although a surfeit of ‘paperwork’ might seem a relatively petty reason for not referring patients to a potentially life saving trial, this may represent another aspect of the companies failure to appreciate the practicalities that ultimately govern the actions of busy oncologists in their daily practice. In a similar way to their lack of appreciation of the how ‘paperwork’ might affect oncologists willingness to enrol patients on the 648 trial, Genentech also failed to understand that (i) unlike in phase I and II trials the patients they needed to enrol were more likely to be treated in local onocolgy centres, rather than academic institutions, and (ii) that the clinicians in these centres might be unwilling to “turn their patients over” (1998: 164) to the trial for social, ethical and/or financial reasons. Apparently the ‘local conditions’ within which the phase III trials were recruiting were significantly different from those encountered in phases I and II. It also appears that Genentech did not fully appreciate how specific the ‘local knowledge’ that was required to complete the trial successfully needed to be. Although they had contracted an external company with a greater degree of expertise in clinical trials to conduct the phase III studies, it seems this company lacked specific experience with cancer drugs. A crucial aspect of this was that “Corning Besslaar had…few contacts in the world of oncology” (1998: 151). Again this was rectified in 1996 when Genentech actioned a “plan to whip up more interest among the doctors” (1998: 159). This involved employing further expertise in the form of lobbying firm Bass and Howes, who were responsible for “courting the oncologists” (1998: 153) and winning their “hearts and minds” (1998: 153). This was a decisive move in turning around the phase III trials of Herceptin, and one that suggests that – no matter how safe and/or effective the product – when considering clinical trials the importance of good marketing should not be underestimated. Despite all of the above complications (and their occasionally tortuous solutions), the outcome of the Herceptin clinical trials in now a part of this “fable for our time” (Bazell, 1998: xiii). In September 1998 the FDA announced Herceptin’s approval on the basis of the phase III trial results, and despite cardiotoxic side-effects in some patients (see pages 171-172). The Her-2/neu antibody – now officially christened Herceptin – was initially judged safe and effective for use in patients with metastatic HER2-positive breast cancer. International approval by, among others, the European Medical Agency (EMEA) followed in 2000. By 2007, Herceptin had been prescribed to over 400,000 women worldwide, including those with early-stage HER2-positive disease (APM Health Europe, May 3 2007). In this post I have attempted to describe both, the ethical dilemmas that present themselves within drug discovery and human testing, and the practical trials encountered in bringing a new drug to market. 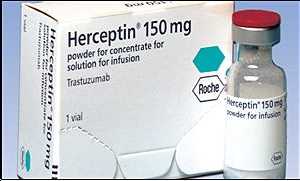 While clinical safety and efficacy – including, crucially, efficacy in comparison to competitor treatments – are the only criteria required in theory, the Herceptin story (as told by Bazell) shows that very many more complex and recalcitrant actors and demands play an equally decisive role. Although a detailed knowledge of the full range of factors noted above probably not required by the UK’s GCSE and AS/A2 curricula (see the BioethicsBytes “Bioethics in the UK curriculum” website for further details of what is required), an appreciation of their presence is arguably integral to an understanding of clinical trials in practice. In this respect, Bazell’s book Her-2 is an excellent, interesting, understandable and comprehensive guide. Bazell (1998) Her-2: The making of Herceptin, a revolutionary treatment for breast cancer is published in the UK by Random House. This entry was posted on Thursday, September 4th, 2008 at 10:49 am and is filed under Book, Clinical ethics, Clinical trials, Extended commentaries. You can follow any responses to this entry through the RSS 2.0 feed. You can leave a response, or trackback from your own site.